Nice idea, what do you mean by moomentum period set to 1? Does that uses two indicators? Or only 1, RSI? (Im using MT4) momentum below 50 and rsi is oversold that is the sell signal? I will update and post as soon as I can. I really don’t want to distract readers from Dennis’s idea and rankings. 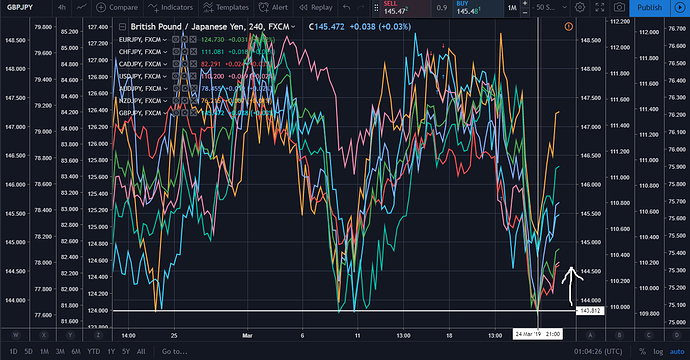 One thing I did forget to mention is the JPY went to the strongest on Dennis’s rankings… It will now go to the weakest… Not in one go and will have pullbacks. I will post how its done in due time. Lets see how it plays out… It got the JPY from weakest to strongest last time out perfect even though I closed the trades early. This is not my trade account but a demo MT4. I installed it to test some of the Snowmans indicators he posts. who’s the new king of the hill? First let me say thank you to Dennis for this thread. I’ve been monitoring it for several months and posted only occasionally. Yes I realize Dennis’ strategy was meant to get a newbie started, not as the “Official SW Trading System,” but this strategy seemed like a good place to start. To test the efficacy of this system, I codified the rules and put it on the MT5 backtester. I’m not 100% certain I have all the bugs worked out, so if something obvious is amiss, do let me know. A #1/#8 pair change is checked at the daily bar close. Data: 1 minute OHLC data. Multiple positions can be run simultaneously; i.e. fixed SL/TP are only way to end a trade. An existing position can be added-to, as long as it was still open when a #1/#8 change occurred to a different symbol, then changed back again. For example, if USDJPY was open, then the next day there was a change to USDCAD, and the following day went back to USDJPY, the position size is now 0.20. SL:TP of 200:100 pips. No trailing stops, no move to $0, no pyramiding, no partial profits, no other money management. Not yet. No exclusions for holidays, weekends, etc. Since my broker is different from Dennis, the percentages I calculate aren’t exactly the same as his. They’re usually quite close. I think I detected only one #1/#8 change that I had that he didn’t in the past several months. For the year of 2018, the strategy does well the first several months then steps downward. There were 102 #1/#8 daily changes; there were 141 days of no-change. The results is a typical MT5 Tester Report, which is HTML with the accompanying images. I’ve attached it as a .zip file. I’m going to look at various permutations of this strategy and see what comes of it. A much better test would be to open a new demo account, place the trades as per the S/W ratings. Forget the Take Profit, you need a lot of pips as per Dennis posts, Stop Loss is fine, but may need re-entry. Re-entry, yes, thanks for mentioning that. My code doesn’t allow for that at the moment. I’ll definitely be looking at varying the SL/TP and having other exit rules that don’t use a TP. US stocks rally so we start the new month with a weak Yen and as I post the Pound is getting hit hard. Using SL:TP of 150:120 gives profitable results for 2018. There is, of course, no guarantee that this would continue, especially with the choppiness of 2019 thus far, but for a newbie looking to try SW, you could use SL:TP of 150:120 as a starting point, then adjust based upon support/resistance, position of price relative to Donchian Channels, etc. I haven’t done any forward testing. I’ll looking into moving the SL to break even next. , I am attaching my data as a .csv. As mentioned before, these values are not exactly the same as Dennis’ values because I use a different broker. These numbers are pulled at exactly 00:00 server time, and that could also introduce slight differences.